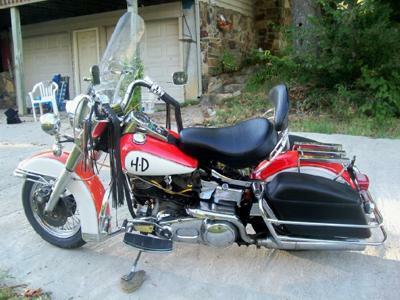 The 1973 Harley Shovelhead for sale is an FLH Classic that comes with the the tour pack that goes on the rear chrome rack. All of the 1973 Harley Davidson Shovelhead's chrome is in perfect condition PLUS it has new tires, a new windshield, new controls, new floorboards, a new motorcycle seat and I also have extra seat if you want to change. It comes with the original deal exhaust system. 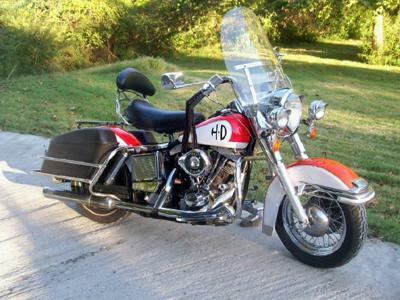 This vintage Harley Davidson motorcycle is a 3 owner bike with matching numbers. I added an Indian headlight assembly but it would be very easy to change out if it's not your taste. The sprockets on the 1973 Harley Shovelhead for sale have been changed to make the 4 speed like a 5 speed. 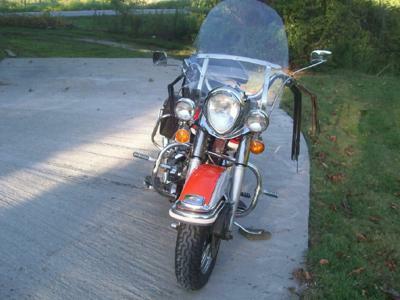 I have had the privilege of owning many Shovelheads and this is one of the best and it ride smooth on the road at 75 miles per hour all day long! It's a very strong running bike that you can be proud to ride anywhere. I just took her on a trip that was 150 miles long and there were no drips, no leaks and all fluids were just changed and it has an updated electronic dist. Everything works and functions like it should and it has a new starter AND even the horn sounds great! The paint is top quality with 10 clear over a two step base coat that anybody who sees the old Shovelhead in person will be impressed with. I've kept the vintage Harley motorcycle for sale stored and protected in a heated and cooled garage.6500.00 will buy her (the bike)-- over twice that invested-- someone will get a great deal, You will be proud of this bike! 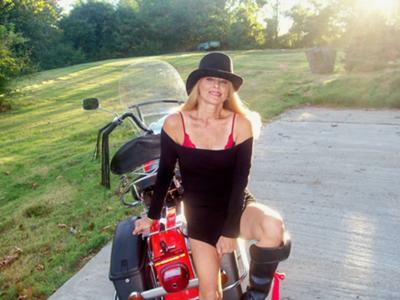 The Harley Shovelhead is located in Harned, Kentucky KY and interested individuals are welcome to email me your questions and offers using the space below provided by GoGoCycles Used Motorcycles for Sale (and PLEASE include your contact information!) and I will respond with answers to your questions or after consideration of your best offer as quickly as possible. GoGoCycles would also encourage bikers to submit a review of the 1973 Harley Shovelhead for sale to make the biker community aware of any problems that are common to it or to highlight the well-maintained Shovelhead's desirable features and help potential buyers make informed decisions. I would like to buy your bike? Please give me a call if the '73 Shovelhead is still for sale. Hey Jim! Did I miss the price? You're right, anybody should be proud to ride this bike and with all due respect....congratulations on your beautiful wife!